I’ve had a number of career conversations lately. People reach out, wanting to pick my brain on various topics: they are interested in “getting into” data visualization or want to write a book. These chats tend to prompt some self-reflection. What advice would I have given myself ten years ago? What would I do differently today? At one point, I had to make the decision: am I good with things as they are, or do I want to scale? In business school, when we talked about scaling, it was mainly conversations around diversifying or acquiring or generally doing things to make more money. But that’s never been my goal. The reason to scale—from my perspective in this space—is to reach more people. I am a strong believer that there is a huge amount of value out there to be obtained by work that is already being done that simply isn’t being communicated as well as it could be. And I think I—we—can change that. In the past few years, I’ve scaled in a couple of ways. First, through a book. 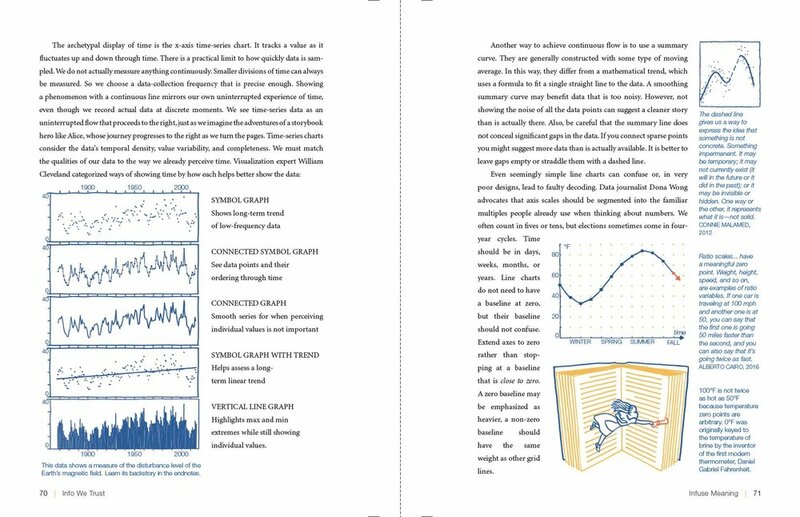 In 2015, storytelling with data: a data visualization guide for business professionals was published. In 2017, Elizabeth and I found each other; she shares my love of data driven communication and is doing an awesome job bringing related strategies to organizations large and small. Randy and Jody do a ton behind the scenes to ensure we are thinking big and the business runs smoothly and efficiently. There are also a number of other lovely people who help support us in different ways. We have officially become a team! Our overarching goal today remains the same—beyond banning bad graphs, we aim to help others be better data storytellers and drive real change through data. We are fortunate that this aligns with something that individuals and organizations recognize as important and want to develop. Still, there is so much more to do. In many ways, we’ve only scratched the surface. As a result, we’ve been evaluating additional means to scale. In the past year, I have been working diligently on my second book (it’s nearly done!) as well as new projects for you (more on this soon!). But we’ve been running at capacity. We can reach more people if we search for others who share our passion. I am excited to announce that SWD is hiring new team members to help with this goal. So, what would I do differently today? Looking back, there have been some difficult points (here’s one, and another, more recently this). But I am very happy with where things are at currently and extremely excited about the future. Though things have been challenging at times, those bumps have, in part, led us to where we are today and I consider myself very fortunate to be able to do what I do and call it work. Because of that, I wouldn’t change a thing. What advice would I give myself ten years ago: look forward to April 2019, when you’ll kick off the process to expand your team and spread the lessons for effective data storytelling to even more people! Visit our careers page to learn more about our current openings. In this challenge, we pull from the premise of Austin Kleon’s book “Steal Like an Artist: 10 Things No One Told You About Being Creative” and challenge the community to emulate a visual they like in an effort to further hone data visualization skills and style. You can participate through 4/10—see full post for details! Info We Trust: How to Inspire the World with Data is a beautiful book. It feels nice to hold. The colors are vibrant. The language is poetic. The content is inspiring. If you work with or have an interest in data, you should own this book. The chapters are relatively short in length but dense in ideas and concepts, which provides good balance. The book is divided into six main sections: (1) Origin, (2) Metaphorical, (3) Mathemagical, (4) Sensational, (5) Informational, and (6) Onward. Also don’t miss the impressive and cleverly formatted bibliography and RJ’s essay on how the book came to be. While I enjoyed it all, I especially appreciated the Mathemagical chapters: Create to Explore, Explore to Create, and Uncertain Honesty. I’m commonly asked questions about exploratory data analysis, and together these chapters pose a number of thought-provoking questions that can help direct those working with data through this process. I also really appreciated the Sensational chapters, which explore a number of other areas (e.g. Museum design), imploring the reader to draw their own parallels to data storytelling. Chapter 16 “Inspire Trust” was another standout section for me, with some great insightful discussion on people’s belief systems and the resulting difficulty of changing minds. There is a candy shop full of ways we get to communicate meaning visually. For example, the concept of importance is naturally associated with size. Big things are important. Why might this be? We start off small. When you are a child, big people like your parents are important. Bigger people, the ones who were already grown up, are much more powerful. Sometimes big adults are even scary. Even longer ago, big animals, you must remember, used to eat us. Big things, whether parent or predator or palm tree, are also important because, to our eye, big things are closer. Ultimately, big things occupy a larger portion of our visual fields. There, big things vie for more of our attention. Important big things stretch, conceptually, into our language (e.g., “I wish you would stop focusing on small matters and see the giant issue we have”). Embodied metaphors transcend language because all people have similar embodied experiences. Big things are important in Zulu, Hawaiian, Turkish, Malay, and Russian. When we make pictures of important things, we do not have to abstract all the way to language metaphors. Just draw important things bigger on the page. At one point, RJ discusses sparking curiosity in your audience. He says—and I’m paraphrasing—that good stories leave space for the audience to make connections. The book itself does this beautifully—not prescribing “do this” or “don’t do that,” but rather making observations and leaving the reader space to make connections and extrapolate to their own work. There are a lot of fun and inspiring surprises throughout Info We Trust that I won’t spoil for you. Let me just end by saying that I highly recommend this book and I hope you enjoy it as much as I did. Thank you, RJ, for creating Info We Trust and for sharing it with us all!